In the film industry, a 'trilogy' is an overused marketing effort to milk the success from major films. It's not always bad, mind - the sequels can still be great, but trilogies are always projected when the first film earns itself a nice box office receipt; seldom are they planned ahead during the writing process. So with that said, it's nice to see Edgar Wright and his team of misfits back for their third outing of a trilogy that's actually inventive; connected by recurring gags and similar geeky nods to their explorations of genre, instead of being designed to soak up the money. Grab a drink and bring on the appropriately titled The World's End! In 1990, a group of five friends concluded their final day of school by undergoing the Golden Mile, a legendary 12-boozer pub crawl in their local town of Newton Haven. Having failed the crawl and consequently gone their separate ways, the group reach adulthood before their tenacious leader Gary King (Simon Pegg) reunites his closest friend Andy Knightley (Nick Frost) and the rest of the gang to give it a second try; however, their return to Newton Haven is met with naught by anxiety and contempt, and they soon realise that something quite disturbing lies at the centre of their former hometown - something that renders the pub crawl the very least of their worries. 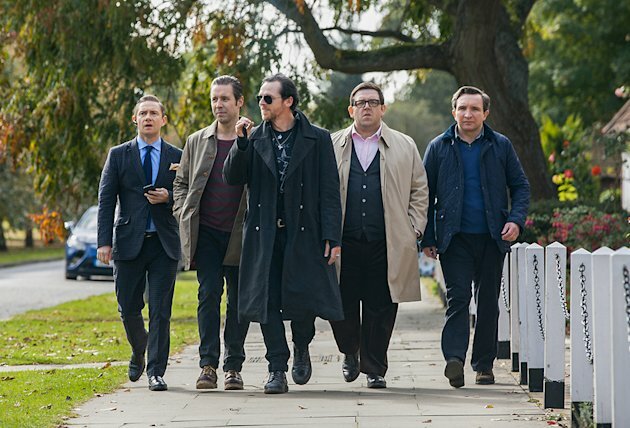 Edgar Wright and Simon Pegg have nailed the genres of zombie horror and buddy cop with Shaun of the Dead and Hot Fuzz, and now have their sights set on sci-fi with The World's End - with their trademark stylistic appeal. The writing is absolute gold from start to finish; Pegg portrays Gary King wonderfully, but its his dialogue that truly gives him such a comedic edge. Every scene involving the characters conversing is lightning fast and throws jokes at the audience relentlessly; and thankfully none of them feel gratuitous or overused. The script has nailed the humour and in some ways tops the past two films in terms of writing solidity. But then the story unfolds. The essential premise has Newton Haven being overrun by a strange presence which simply paves the way for an abundance of slapstick fight scenes and nothing else of any substance. 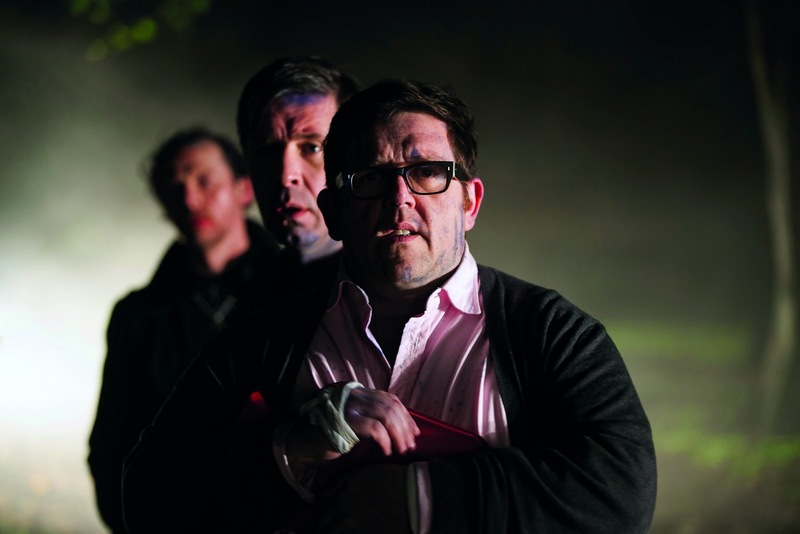 The writing remains as good as ever, but seeing Nick Frost become an aggressive killing machine gets old very fast, as does seeing the plot go in no clear direction. The premises of Shaun of the Dead and especially Hot Fuzz had ridiculous but clever ideas implemented into them; they had some genuine tension and emotion, but The World's End lacks such appeal. The premise is to be laughed at and nothing else - this quickly gets boring, and the film's 109 minute run time begins to feel like decades. It's a real shame, but it feels like the story tries to mimic the ingenuity of the past two films to no avail. 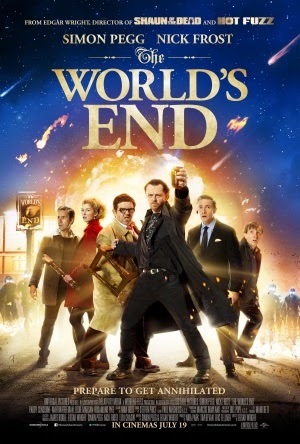 Nothing about the central concept of The World's End is very clever or engaging - the violence isn't as appealing as it was in Shaun of the Dead, and the plot is nowhere near as complex or enigmatic as that of Hot Fuzz. A solid British comedy lies beneath the iffy concepts, and criticising the wit and comic gold within the dialogue is simply not possible. However, at the end of the day, Wright and Pegg haven't managed to top their previous efforts and some viewers are bound to come away disappointed.